For those still trapped by the daily working rat-race of life how many times have you desperately waited for a Bank Holiday weekend, and then the weather is pooh? All week you’ve looked out of your office window longingly at the sunshine, counting the hours before you can escape. The big day arrives and then it rains! Not just spits and spots of rain where you can dodge the raindrops, or even a drab mist, but full on rain like a bucket of water thrown down on you from above. Good Friday was one of those days. We went to the beach for lunch and not trusting the erratic weather we pre-booked a table inside the restaurant. Sure enough, right on cue, it started to rain – again. Being Easter weekend the place is packed with holiday makers. We noticed some Swedish tourists, who, unable to reserve a table inside the restaurant, sat outside on the terrace. Unfortunately, just as their meal arrived, down came the rain. 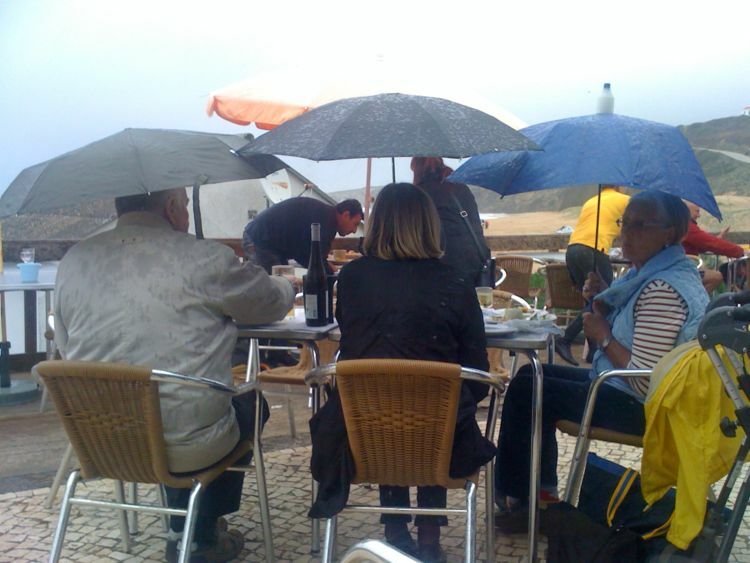 However, unperturbed by the weather they improvised and finished their meal sheltering under their umbrellas. Who cares if it’s raining we are finishing our lunch! 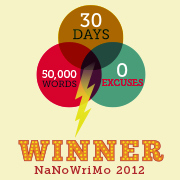 Even as write, I hear the rain hammering on our roof and gurgling in the gutters. As it lashes against the windows I draw the curtains to shut out the distorted images it creates and imagine the sun. It is beautiful in the Algarve when the sky is a brilliant blue and the sun shines, but when it rains it is bleak and miserable. I feel so sorry for all those on holiday at the moment. I just hope they packed a good book and their water wings because apart from eating and enjoying the wine, there’s not much else to do. You have to admire the Swedes tenacity. Would you have done the same? It did exactly the same here in the DR. It almost always rains on Good Friday and the Dominicans say it is because God is upset his son died. Usually it is the first major thunderstorm of the year – this year it was just heavy constant rain for 24 hours. Spring showers bring May flowers – Happy Easter! Sorry to hear it’s raining over there. Could be worse – we’ve just had a snow storm here in Worcester Park, Surrey and it’s 2 degrees. Fond memories of when we were in the Algarve just over a month ago and were basking in the sun, in the pool on Sunday 24 Feb and it was around 20 degrees. Enjoyed your photo of the Swedes sheltering under their umbrellas. The restaurant looked familiar – was it O Sito Rio at Carrapateira? I thought your previous blog about learning the language was spot on. I’m sure it chimed with many of us who struggle to learn Portuguese. I smiled at the mix up between eggs and grapes. Something I do now to help improve my grasp of the language is to watch their rolling news programme on RTP, ‘Bom Dia Portugal’ which has the advantage of clear speakers and frequent repetition. They have a segment called ‘Bom Portuguese’, where they Vox Pop on the streets of Lisbon and question people about the spelling of certain words and phrases. Not every native gets it correct which makes us non-natives feel slightly better. Hope the weather improves over Easter for you. Now it’s two jumpers and a rain coat as the cruel wind cuts you to the bone. I am glad my ramblings about learning the lingo struck a chord with you. Considering I have the retentive memory of a sieve and the concentration span of a dyslexic gnat I’m doing just fine…er sorry I’m telling porkies. I’m struggling and have resigned myself to the probability that hell will freeze over long before I can hold a meaningful conversation in Portuguese. But it’s a challenge! No, the restaurante is not at Carrapateria. However, yourve just reminded me we have not been there for years and we must go. I remember seeing the segment called ‘Bom Portuguese’, where they Vox Pop on the streets of Lisbon and question people about the spelling of certain words and phrases. I’m not too bad at spelling it’s the speaking and understanding thats’s the problem. Unfortunatley we no longer have Portuguese TV, since they changed from analogue and we needed to buy a box. To be honest I don’t even watch English TV to that extent. But I should spend at least some time listening to YOuTube and kids progs in Portuguese. When do you return to Portugal? You know I hate to gloat, Pip, but it was brilliantly sunny all day and I thoroughly enjoyed my romp along the beach. Rosy cheeks, of course- it IS still March. You can’t begrudge us- how long have we waited for this! Hi Jo, it was sunny this morning saturday, but Friday it was pigging awful. Is this sun in the UK? Yeah, yeah! No flights booked at the moment. In Poland with Dad end of April. We were just debating about where in the Algarve you live. Somewhere up the west coast? Well, when you live in Sweden you are used to rain: so it must have felt just like home! Hate to gloat [; ) !] but it was 26 C and not a cloud in the sky yesterday . . .
Can I join you? Grrrrrr….it’s Easter Sunday now and the weather is dreadful. The poor tourists in the villa next door I don’t think they have left the house since they arrived. What a pity when one may have planned and saved up for ages!!! I do admire the Swedes. I wouldn’t have done the same. I always forget my umbrella. I admire their tenacity . . . but am sorry that they didn’t have blue skies overhead for their luncheon. Great capture in that photo! Happy Easter PIP. I can think of worse things than listening to rain, sipping wine, and reading a good bood. And when the sun returns, you’ll be ready to go out to play! Oh, very brave of them to carry on eating under their umbrellas. My husband and I also spending the weekend away, but we also got rain and grey skies, where we went to in Port Lincoln, South Australia. Have a good Easter, Carole. We are in desperate need of rain and have vowed to never complain about the rain no matter when it arrives…please send some our way the garden is thirsty. We shared the same rain in Portugal and went to Tomar for the weekend. Luckily we booked a chalet but felt sorry for the German campers next door in their rain soaked tent on Easter Sunday. I admire the folks sitting out in the rain making the best of a bad situation. I wouldn’t have done it unless I was just starved and then I’d of probably sat in my car. It sounds like your weather is like ours. I too can hear the rain as I write. I wonder if it’ll ever take a break long enough for us to work in our main garden.